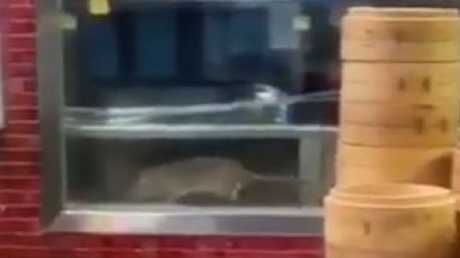 A LARGE rat has been filmed scampering across the kitchen in one of the Sydney outposts of popular restaurant chain Din Tai Fung. The rodent was captured running across a counter in the Westfield Sydney venue with footage posted on YouTube and Reddit. 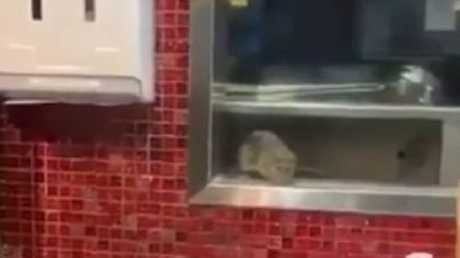 In the video a man's voice can be heard saying: "You don't see the rat?" It's unclear when the footage was taken but it was posted to YouTube yesterday. Do you see it? Rat spotted at Din Tai Fung, Westfield Sydney. The footage appears to have been captured during a quiet time as there is no one behind the counter and no customers can be seen in the foodcourt. Din Tai Fung is located in the foodcourt of the CBD Westfield complex and is an extremely popular venue, famous for its steamed dumplings that are hand made to weigh between 4.8 and 5.2 grams. A statement from the City of Sydney said it had been made aware of the footage but had not received any complaints about it. "A City environmental health officer inspected Din Tai Fung this morning and was informed staff that the business had been voluntarily shut down," the statement said. Council has issued a prohibition order and the eatery will only be able to re-open after a satisfactory inspection. The statement noted that major demolition and construction works throughout the CBD had stirred up rat populations and had led to increased rat movements. "Unfortunately rat activity can't be completely eradicated and there will always be some public areas that require further baiting, particularly where food and waste are discarded by the public," the statement said. Din Tai Fung also released a statement that said it had brought in pest control specialists after being made aware of the incident. Din Tai Fung has brought in pest control specialists. "Din Tai Fung has in place stringent food safety protocols," a statement said. "We take this matter very seriously. "Once notified of this incident, we immediately activated our pest control specialists as well as professional cleaners to inspect and disinfect our premises as a priority. "We are also conducting thorough investigations and improving measures in pest defence during post-operations hours. This is important as we already clean, disinfect and secure the kitchen on a daily basis, yet it's clear we can do even better." It said the store had arranged for pest control specialists to attend to the entire food court. "Westfield Sydney and Din Tai Fung conduct regular proactive pest control inspections using professional contractors. "We apologise for the situation and would like to assure our customers that we are doing everything we can, together with Westfield Sydney, to address this. "Food safety is of utmost importance to us and we would like to state our unwavering commitment to this, and to thank our customers for their support and understanding." Din Tai Fung, which began as a humble stall in Taipei, was once described by world renowned chef Ken Hom as making the "world's tastiest dumpling". There are now restaurants located around the world and other areas in Sydney including at Chatswood, World Square and Central Park.